A high-fidelity replica space shuttle passes by the entrance sign to NASA’s Johnson Space Center, on its way to the center’s official visitor attraction, Space Center Houston, on June 3, 2012. HOUSTON — A replica space shuttle went on a Sunday morning (June 3) road trip, making its way from the lakeside dock here where it arrived on Friday to the NASA visitor center where it will go on public display. The 1-mile (1.6-kilometer) trek was originally scheduled to take just three hours to complete, but obstacles along the way doubled that time . 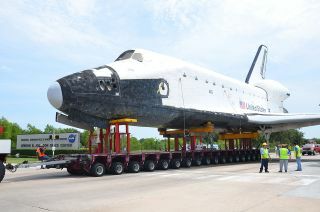 The mockup, loaded atop a 144-wheel transporter, was slowly and methodically trucked down NASA Parkway — also known as NASA Road 1 — to Space Center Houston, the official visitor center for the Johnson Space Center (JSC). Houston fire boats offer a welcome salute to a space shuttle replica that arrived at the city's Clear Lake dock for delivery to Space Center Houston for public display on June 1, 2012. The replica's road trip, which got underway at 7:39 a.m. EDT (1139 GMT), quickly encountered its first snag. The truck and mock shuttle-topped trailer were too long to navigate the turn off the dock onto the parkway. After several tries by the driver to angle the transporter, technicians went to work hoisting a traffic light out of the way. Finally, unhitching the truck, maneuvering, and re-connecting it to the trailer got the shuttle moving again after a 45 minute delay. That was just the first of the blockades the 122.7 foot long by 54 foot tall (37.4 by 16.5 meter) replica needed to navigate around and under. Its 78-foot (24-meter) wingspan extended from the road's shoulder to the median, stretching over three car lanes, requiring workers to swing more street lights out of the way and trim too tall foliage — trees — lining the route. The transporter also had the ability to raise and lower the mockup, or just one of its sides, and at times it appeared as if the shuttle was banking over the trees. "If you look at it from here, it looks big," Space Center Houston president Richard Allen said on Friday, looking at the replica from a few hundred yards away. "But if you start walking toward it, it gets bigger and bigger and bigger. It's a huge vehicle and I think that the enormity of that is really going to strike a chord when [visitors] come to see it." Hundreds of spectators lined the road to see the shuttle, while more gathered at Space Center Houston for a free, family-friendly display of space exhibits. For the last leg of its short trip, the replica bypassed the visitor center's entrance and cut across the grass, which had been lined with wooden planks. Space Center Houston has cleared an area, where the mockup will be mounted on a concrete base and pedestals. By this fall, the center plans to have a rampway erected to allow visitors to walk through the replica's crew compartment and view down the length of its payload bay. Built in the early 1990s by Melbourne, Fla.-based aerospace replica manufacturer Guard-Lee, Inc., the mockup is considered to be the highest fidelity model of the shuttle ever created. Built using schematics, blueprints and archived documents lent by NASA and its shuttle contractors, some of the replica's parts, including the tires used on its landing gear, are authentic to the now retired space shuttle program.